Artist Roan Bontempo stands in front of a printed installation. The garden theme carried through most of the pieces in the exhibition. Photo by Lluvia Moreno. Vibrant photographs printed on fabric hangings ripple in the evening breeze as visitors move around artist Roan Bontempo’s exhibit, where she offers an intimate view of the memories and emotions growing in her garden of artwork. Her installation opened at UC Santa Cruz’s Eduardo Carrillo Gallery at Elena Baskin Visual Arts on Oct. 11 and will continue through Oct. 17. Visitors of “a garden, too.” take in the vibrant artwork on the walls of the Eduardo Carrillo Gallery. Photo by Lluvia Moreno. 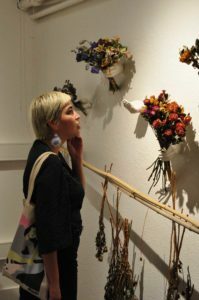 Bontempo is currently in her last quarter at UCSC, majoring in studio art and business management economics. 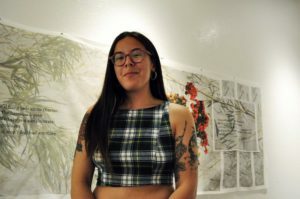 Her senior show “a garden, too.” explores the process of trauma recovery and features a collection considering what it means for healing to be conditional, like a growing garden. The name was inspired by her grandmother, who once said flowers were her therapy. The installation is a culmination of Bontempo’s investigation into memory, which she started in her first years of college. While Bontempo has created art since she was a child, majoring in studio art provided her with opportunities to experiment with new materials. Her installation includes woodblock prints, analog photographs, illustrations and sculpture. But the medium Bontempo is most drawn to is film photography because she sees photographs as opportunities to preserve fleeting moments and memories. Since then, memory has remained a constant theme in Bontempo’s art. In her early works, she investigated identity by shooting portraits of her friends and family. She was interested in using portraiture to capture her subjects’ personal histories and the memories that shaped them. “If I ever do portraiture, it’s always dealing with those people’s memories, and it’s always my job as a photographer to carefully convey that,” Bontempo said. Documenting people’s stories led Bontempo to think more about her own family and the childhood memories that stayed with her into adulthood, especially those of coping with her mother’s struggles with addiction. Bontempo’s exploration into memory and family eventually settled on themes of recovery, reconciliation and the many ways healing can be cultivated. Her current installation considers how trauma is passed down through families and the multigenerational process of healing. “a garden, too.” compares the process of reconciling difficult memories to cultivating a garden. Both require time to grow and change. Bontempo recognizes memories never disappear, so it is important to nurture a metaphorical garden of healing in order to deal with those emotions. The garden theme is apparent throughout Bontempo’s installation. On one wall, plaster hands reach toward the center of the gallery supporting bouquets of dried flowers and preserved insects. Another wall holds a large tapestry printed with a collage of bamboo, flowers and a photograph of the artist as a child. For Bontempo, healing means creating art. Her grandmother taught her to create in order to heal and she hopes her work will speak to others. Correction: A previous version of this article incorrectly stated that divorce was a theme in the artist’s work. This statement was removed.